Facebook’s developer conference, Grockit, a social learning company, announced a new integration with Facebook that will make it even easier for students around the world to create Grockit study groups with their friends. Now people using Grockit can quickly create “Study Rooms,” invite their Facebook friends and prepare together for college entrance examinations, such as the SAT, ACT, LSATs, GMATs, GREs, and more. Students can also track and share academic progress and milestone achievements towards their academic goals on their Facebook profiles. Earlier this year, Grockit released research showing that students who study together on Grockit do twice as much work — and get answers correct more often — as students who study alone. 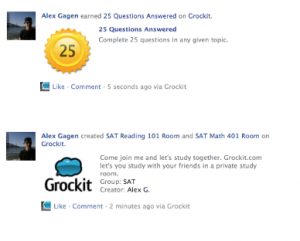 In addition to creating new study groups, people using Grockit can share the total number of hours spent studying, the total number of questions attempted, and their progress studying within Grockit via their Facebook profiles. People can control how their activity is shared with friends on Facebook from their Facebook privacy settings.